You know the importance of wearing high quality clothes above water. It is only logical that you are properly suited underwater as well. Especially in an environment that is not natural to our bodies, having a high quality wetsuit will ensure that your underwater experience is more enjoyable. When diving underwater it is crucial that you only consider the best diving wetsuits. This will mean one that can handle the depths of the ocean. This is different from the best surfing wetsuits which will allow a lot more buoyancy and mobility. When deciding on the best wetsuit for you, it is important to get one that is built to last. Deciding on what you will be using your wetsuit for and buying one that is specifically designed for your use will ensure that you get the highest quality materials and best performance from your suit. Even when going in warmer waters, having a dive suit will ensure that you are not only warm, but also protected from the underwater world. Getting a light 1 – 2 mm suit can protect you from jellyfish, sun and coral without insulating your body. To help you with your search, we have constructed a list of the best wetsuits on the market. This will help you decide on the perfect buy for your next adventure. 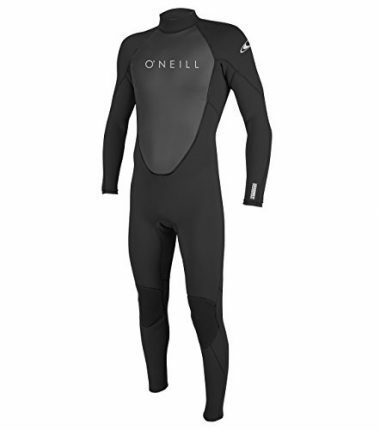 O’Neil is famous for high quality wetsuits and this 3/2 millimeter option is no exception. Featuring a “Superseal neck” and flatlock seals it creates a comfortable and secure fit. Not only is this a perfect surfing or paddle boarding suit but can also be used for scuba diving. The 3/2 millimeter rating allows you to go in water that your body wouldn’t be comfortable in naturally. 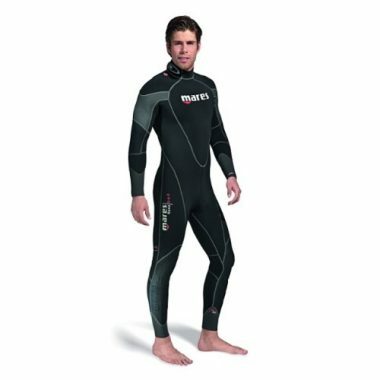 There is added protection for places you need like the knees Highly regarded as the best mens wetsuit you can bring this suit with you on your next adventure no matter where it takes you. This EXCEL wetsuit is great option for deep water diving. The thick suit will keep you warm no matter where you are diving in the world. Features like a seamless drylock waist and a back semi-dry zipper ensure no cold water will enter your suit. An easy to use zipper system around the ankles make this suit easy to put on and take off. Padding around the midsection and legs coupled with a plush liner gives you cushioning from the elements and ensure you stay warm. Knee pads will allow you to crouch and kneel on the bottom of the ocean or preparing for the dive on the boat. The suit is made of a stretchy material that gives you the freedom to move around without feeling constricted or stiff. Scuba wetsuit reviews are raving about this suit claiming it to be the best diving wetsuit on the market. This neoprene wetsuit is ideal for surfing. The full body design allows you to get up close and personal with the water while staying warm. A 3/2 millimeters system coupled with its own SuperSeam Weld technology you will not have to worry about the elements. The zipper system is easy to use and even comes with a drain hole for unwanted water in your suit. O’Neil’s years of experience creating wetsuits has led them to create this Psychofreak brand. It has also prompted them to add extra insulation to the areas that need it most like your legs, chest and back. Coming in six unique color schemes you will always stand out of the crowd. 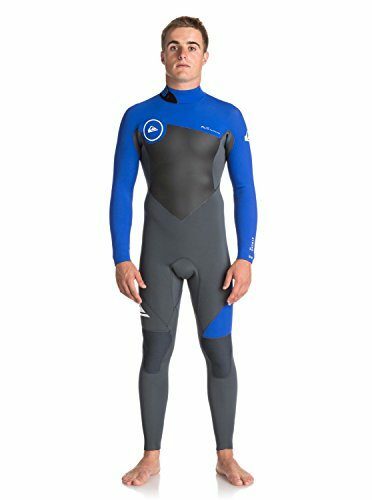 Topping the charts among top rated wetsuits, this is quickly being considered the best surfing wetsuit on the market. Women have different anatomy than their male counterparts and need suits that fit perfectly. The Scubapro OneFlex Steamer suit does just that. It has been designed to wrap around your body and give you the comfort and warmth you need while in the water. The suit is flexible which allows you to put this suit on with ease and move around like you aren’t even wearing it. The 5-millimeter thick material is the perfect size for surfing and scuba diving alike. It will allow you to swim and enjoy cold water for those out of season days. Made with a highly durable nylon and neoprene rubber material this suit will stand up to the elements for years to come. This continues with the extra tough knee pads which give you padding to kneel on the bottom of the ocean to see everything it has to offer in comfort. The included zipper leash makes this an easy suit to put on by yourself and the moulded legs and arms make walking and moving a breeze. 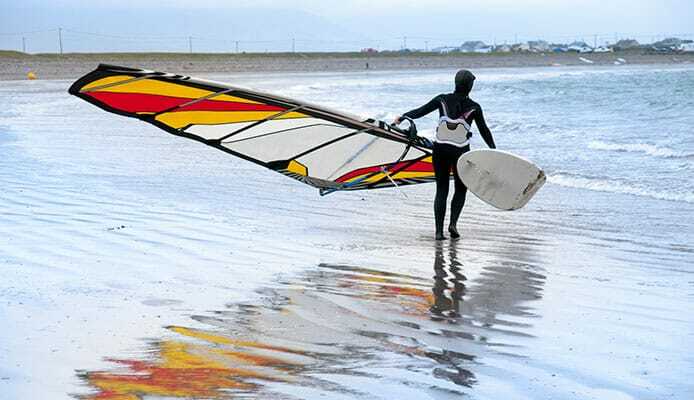 This wetsuit has been highly regarded as the best womens wetsuit on the market. The Bare Velocity wetsuit combines a super-stretch technology with a 5 millimeter thick material. This gives you the freedom to dive in colder water while still maintaining a free range of movement. An adjustable velcro collar keeps cold water and air out of your suit and allows you to focus on paddling or diving. The zippers along the ankles makes this suit even easier to put on and take off quickly and can offer ventilation for warmer days. Don’t worry about your knees as this suit has pads which provide grip and added comfort. Designed for comfort, this mens wetsuit is very stretchable allowing it to perfectly fit to your body. This ensures that as little water can seep through as possible giving you a warmer dive. The back zip makes it easy to get in and out of this wetsuit and a neoprene flap ensures the zipper stays sealed for added protection. Equipped with a Back Protection System (BPS) which adds an additional layer of neoprene to the back of your suit which adds insulation and comfort to your suit. This full wetsuit is sure to keep you protected with its incredible attention to sealing off your suit. SuperSeal cuffs keep water from entering near your wrists while plasma ankle seals protect your legs. A Double Superseal neck sits tightly to your skin giving you added protection. A 3 / 2 mm thickness makes this wetsuit perfect for warm water use. While your back and chest get added protection, the material around your extremities is lightweight to provide excellent range of motion. A single Fluid welded seam is more than enough to protect you during your warm water dive. This technology also helps ensure that your suit will last you many dives giving you great value for your money. The chest zip on this suit is easy to use and do up when you are on your own leaving you completely independent to dive whenever the mood strikes. This full mens neoprene suit contains only the highest quality Nylon Neoprene. This allows it to have an impressive 75% more stretch than your average wetsuit. This makes this suit all the more easy to get in and out of and also provides excellent mobility. 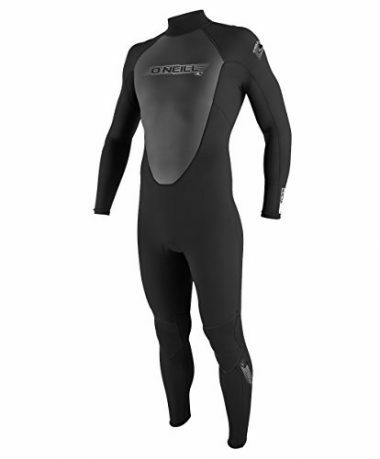 A GBS construction makes sure that this suit can withstand the cooler temperatures keeping you warm on your dive. An adjustable collar allows you to get the best fit while keeping it secure and ensuring that water does not penetrate your suit. This wetsuit is sure to last as it holds up well to friction which makes it great for all your added accessories. Durable Freedom-Flex knee pads ensure that your range of motion is strong while giving you added support on the quick-wear areas. This is especially important when constructing wetsuits for surfing. A quality suit doesn’t have to be expensive. Made with quality materials and a tough construction, this wetsuit won’t break the bank either. This men’s suit is built to last. A flexible high quality 5mm neoprene suit is great for cool water temperatures. This design is heavy duty with thermal bonded knee pads which allows a better wear where you need it most. The YKK back zipper and the Velcro collar makes the suit easy to get into. The velcro collar is adjustable to your body to ensure minimal water seepage. This suit is secure so that minimal water gets in. This is seen with the Lycra trimmed wrists and the ankle seals that secure the suit. The seams of this suit are not only sewed but glued as well to prevent water from entering. This suit is designed for men which means it takes into account their shape. A 5 mm thickness allows you to dive comfortably in cooler water while still giving you excellent mobility in your arms and legs. Dive with peace of mind knowing your suit is equipped with an internal key pocket so you can ensure your car key stays with you. This neoprene full wetsuit has bonded seams which allow it to hold strong. Made using F’N Lite neoprene material this suit is 16% lighter which makes a huge difference to your comfort. The neoprene is full of air cells which produce a lighter design while not compromising on insulation. This suit has split thickness which allows your vital areas to have added warmth while your extremities have added mobility. A Pliotech thermal air chamber further insulates your chest and back allowing you to stay warmer. When deciding on the best wetsuit to buy it is important you look for a few key features. This will ensure that your expensive purchase will only need to happen once and gives you the best value for your money. It is important to get the best wetsuit that is specifically designed for what you will be using it for. This is because of the amount of buoyancy in your suit will affect every activity from diving to surfing. Wetsuits for scuba diving are also designed to be able to handle significant depths and colder situations. This is the most important thing to consider when buying your suit. One of the biggest factors that should determine this is the waters you are going to be doing the majority of your diving in. The thickness used to dive in the coastal waters of Washington will be vastly different from that needed in the Gulf of Mexico. Typically wetsuits will have between 3mm and 7mm of material with some coming as thin as 1-2mm for very warm waters. To make matters more confusing, some wetsuits come in a thickness represented by two numbers, for example 4/3 mm. The first number will be the bigger of the two representing the thickness of the torso while the second represents the thickness of the arms and legs. This is to protect your vital organs as a priority. These suits give you more range of motion and mobility than ones that utilize the same thickness for the entire body. The thinner material around the shoulders, elbows and knees allow your joints to bend more naturally and with less resistance. As a general rule, it is recommended to go by the following table. Going by the temperature of the water, you can find your recommended thickness. It is important to take into consideration your individual tolerance to being cold. *If you are diving in water colder than this it is recommended that you dive in a dry suit. This will add protection making your cold water dive more safe and enjoyable. Like every other piece of clothing you put on your wetsuit will come in a specific style. There are three different styles to choose from. It is important that you try on all of them and find the one that is most comfortable for you. This is a wetsuit that has short sleeves. It is also cut just above the knee and is recommended only for warmer waters. This type of wetsuit will be much more comfortable and significantly easier to get in and out of. Surfers who like to frequent the coast of California can be seen wearing this style during the summer. A full suit goes straight down to your wrists and ankles providing more protection. It also adds a significant amount of warmth to your dive. This type of suit is great especially for new divers as it will protect you from corals and jellyfish. These suits are generally made of thicker material and can even have added insulation. This is not what comes to mind when thinking about the best wetsuit. This style comes in two pieces with one that acts as an overall stretching to your ankles while leaving your arms open. The second piece is a jacket that goes over top to keep you warm. 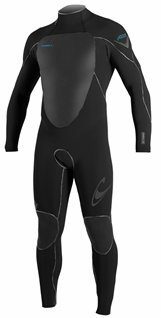 This type of wetsuit works very well in very cold water as it provides your core with even more insulation compared to a traditional style wetsuit. There are also many different types of materials used when constructing wetsuits. This is the highest quality material used to construct wetsuits as it is soft and incredibly flexible. The neoprene material effortlessly forms to your body which provides better insulation and keeps you warmer. This material moves effortlessly with you making you more comfortable and allowing a greater range of motion. It is also more costly and more delicate than other materials used to make wetsuits so companies combat this by adding extra padding to areas that experience the most wear and tear such as the knees. The most commonly used material to make wetsuits is a closed cell neoprene. It is very cost effective option which makes it more desirable for entry level divers and surfers. This material has a rubber like feel that is quite rigid making it very durable. The rigidity makes these types of suits more difficult to put on and take off. One drawback to this type of material is that it doesn’t insulate to the same degree as an open cell. For this reason we suggest using this in warmer waters. Lycra is only used for lightweight wetsuits for warm water diving environments. 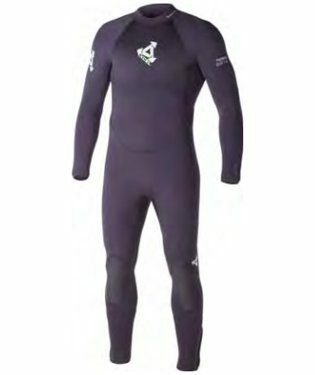 Being extremely lightweight this type of wetsuit isn’t designed to insulate your body but rather to protect you from the sun and any underwater corals and rocks. It is a material that is used in shorty suits used for the thinner arm and leg material. There are four different constructions that are used by manufacturers to secure the seams. This is an aspect that can also affect the comfort of your suit. Thick seams can add pressure and discomfort to your dive – something you want to avoid at all cost. This is a seam stitch technology used on suits for warmer water. It is desirable because the stitch is on the inside giving the best wetsuit a clean look. Overlock stitching is recommended for water 65°F or warmer as it does let some water through the seams. Often called a flatlock stitch it is visible on the outside of the suit. The inside seam sits flat over your body which makes it a much more comfortable option rather than the overlock stitch. This is one option that does not add bulk or bunching to the thicker areas of the suit. It is a high tech feature that will make your day on the water more comfortable and enjoyable. As some water does penetrate your suit here it is still recommended for use in warm water. This is similar to the flat stitch in that you will see visible seams on the outside of this wetsuit but it will be much narrower. The seams are glued together and then stitched as well which greatly reduces the chance of water seeping through the seams. This is an excellent option for people diving in colder water. Referred to a fluid seal the GBS is similar to a standard GBS but incorporates a tape on the inner seams. This allows an even stronger bond which is better at reducing water from seeping into your suit than any other type of construction. This is one of the top technologies that allow you to withstand extremely cold water of 50℉ or below. This is a very important factor to consider when looking for the best wetsuit. Not only will it determine your comfort underwater but getting a suit that doesn’t fit properly will not protect you from the elements as well. One that is too big will let more water leak in and thus not provide adequate insulation. Getting one that is too small will make it difficult to put on and also cause stress on the seams of the suit. It is worth noting that scuba suits aren’t cheap. Ranging in price from $100 to well over $500 this purchase should be seen as an investment. As the price is higher than your average clothing buy it is important to get a quality piece that will last you for years to come. Comfort and protection under water will allow you to get the most out of your underwater experience so it is important to get one that fits properly, even if that means spending a bit more money. Q: How To Take Care Of A Wetsuit? A: Your wetsuit can cost you a lot of money, but more importantly than that, they offer great protection. You want to take care of it for both reasons, but especially for the latter. When your wetsuit is exposed to a lot of salt water, it can become damaged. After you remove your wetsuit, you should rinse it as soon as you can. Use fresh water to rinse the salt water from the suit (and to rinse off any other debris). Make sure to rinse the inside and the outside of the suit. You should then hang your wetsuit to dry. You can dry the wetsuit in the sun if you wish. After your wetsuit is dry, store it in a dry and cool place, and try not to fold it. Q: Why Do I Need A Wetsuit? A: A wetsuit keeps you warm in the water, and it provides a barrier against any impacts with the water. When you are participating in a water sport such as surfing, you will be hitting the water a lot. A good wetsuit cushions that impact. When you are in the water, a wetsuit will keep you warm. It only takes a drop in temperature or a couple of degrees for the risk of hypothermia to start. Combine a wetsuit with come boots and gloves for the best protection. Q: What Is The Difference Between A Wetsuit and Drysuit? A: A wetsuit its the water in to form a layer between the suit and your body. This layer helps the temperature to leave your body more slowly than it would without. A drysuit creates a complete barrier between you and the water to keep you completely dry. A wetsuit should be seen as an important investment with any water activity. Getting a properly fitted high quality suit will not only ensure that you are more comfortable but it will also keep you warm and safe while at play. When surfing, a wetsuit should provide lots of mobility while keeping you warm. Oftentimes this is seen with the best wetsuit that has multiple thicknesses such as 3.5/3mm. This keeps you warm while giving your extremities added mobility. When diving, you don’t need quite as much range of motion while having proper insulation takes priority. Buying the best wetsuit will ensure that your underwater experience is comfortable and safe making it that much more enjoyable. Do you have a wetsuit on our list? Let us know how you like it in the comment section below.